Some days you just want to go for a picnic and yesterday happened to be a day just as such. We had planned for the picnic all day. My visions of sitting on a beautiful hill looking out as the sun dove beneath the waves were wonderfully planned. Taking care to remember this was the Marin County coast and would be chilly, my menu was made just with that in mind. For all the anticipation, things never go as planned. The fog came out to play, so thick we couldn’t even see that there even had been a sunset or an end to the waves meeting the skies. Not much to look at after my visions, eh? How about a handsome Duck in your picture instead? Because at the time I didn’t think taking a picture of what I had described above was necessary, being just a disappointment. None the less, the evening picnic was saved by just such company kept and the delicious meal I had planned and cooked all afternoon…well except for the two hours I left to go see Guardians of the Galaxy with Duck. 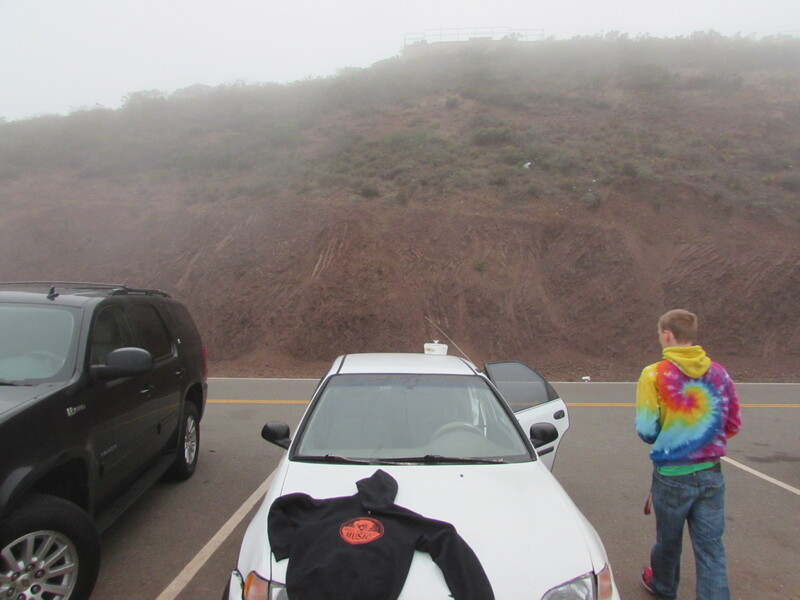 We pulled out the sweatshirt and sat on the car hood to partake in our meal. Perhaps you ask how this amazing presentation for a quaint picnic was done. Simply I had reheated what I thought was enough for two portions, along with the casserole dish in a 350 oven until we were just about ready to leave. Our meal also came with freshly-made, corn-filled, 100% vegan cornbread and proper Early Grey tea with a touch of honey and milk. 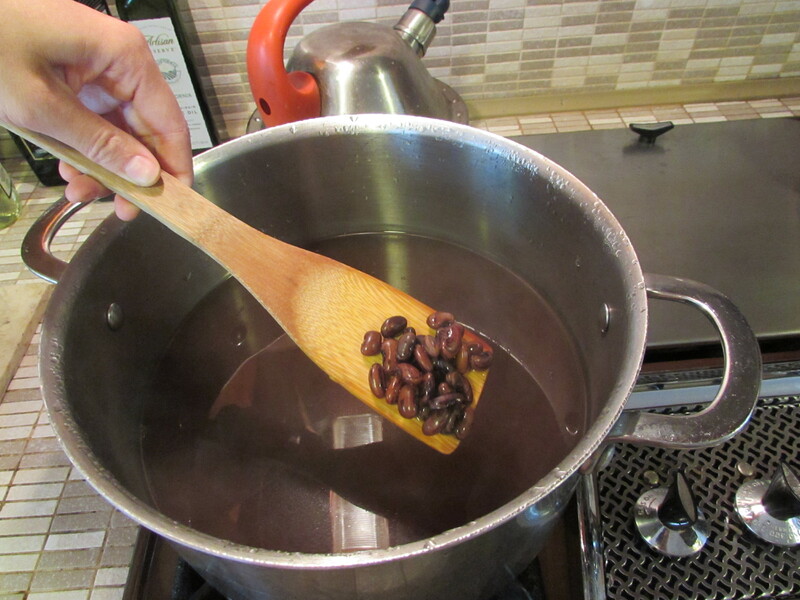 Fill a giant stock pot with enough water to cover the beans two inches high and bring to a boil before simmering for probably 10 minutes, then switch off the gas and let them rest for an hour! That is all there is to quick soaking. Right before took this picture, all the sediment and beany stuff was on the bottom of the pan and you could see the beans really nicely, but then I stirred it and took the shot. Oops. While those beans be a’resting in their hot water, you can st art to chop up one large yellow onion. Put another pan on high heat and add oil before dropping your onion and tossing to coat in the hot oil. Let those onions sweat until translucent, tossing now and again while you dice up two large carrots and four large celery stalks. If onions get translucent while you are still chopping up celery after carrots, just throw in what you have already chopped and saute away. I was chopping and sauteing a good half hour while my beans soaked so my timing would be perfect for the movie leave-of-absence. 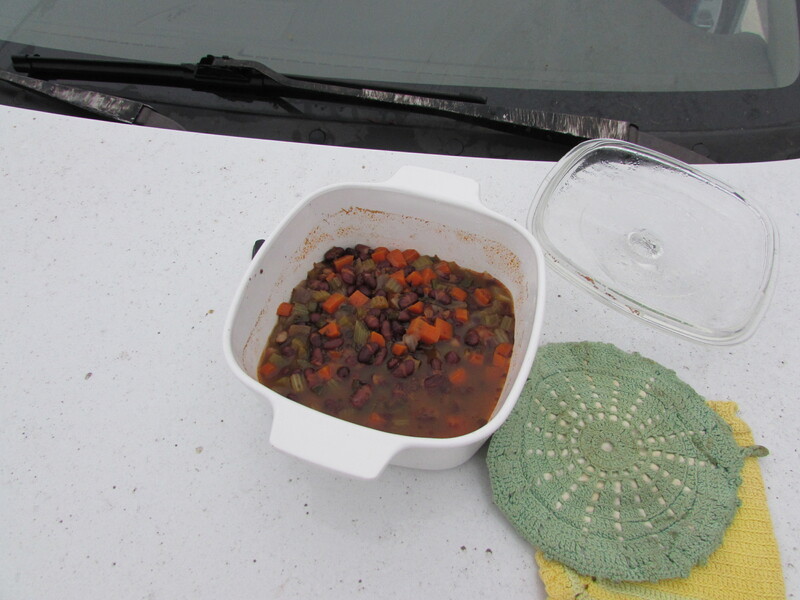 Once all the things are nicely sauteed my beans were still not down soaking. Quick fix is just to leave them on the stove and cool down a bit. My next step was once the beans were drained I heated more oil in the stock pot and added my poblano pepper, sauteing just for a minute while it turned a brighter green. Then I added in 1 tablespoon worth of tomato paste and the other sauteed vegetables, letting a fond grow along the bottom of the pan. Fond is a french term for yummy crud that is browned and developed admirable flavor. I scraped th is crud off the bottom of the pan, added some of the stock from my 32 oz vegetable stock jug and scraped again to deliver flavor to all edges of the vegetables. Adding all my beans back to its soaking pot then the rest of the vegetable stock and giving another stir. Oh yes, did I forget to mention this entire time since the poblano pepper that I have been adding dashes of dried oregano worth about a tablespoon in total to the dish. That is the stuff you see floating in the stock. From there it gets easier as all you need do is bring your soup to a boil then turn down to a simmer as low as possible and lid the pot, leaving just a crack for some steam to escape. 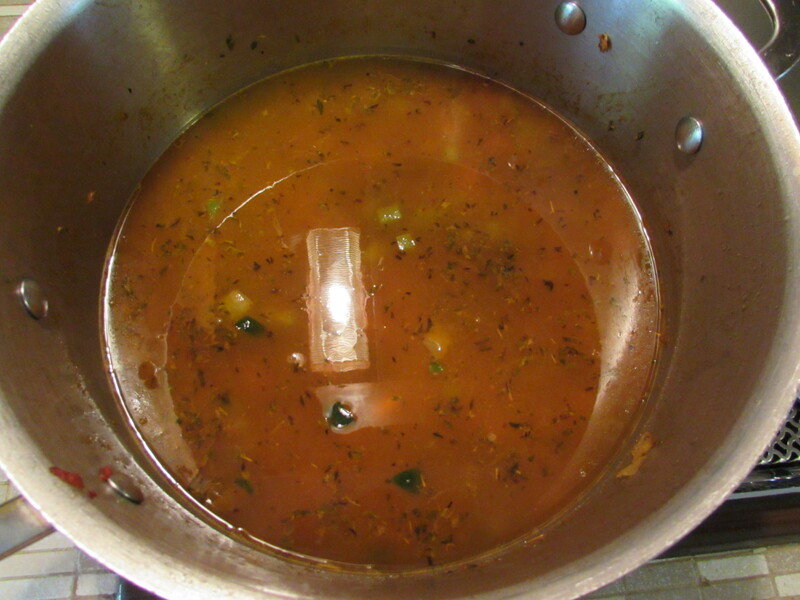 This will reduce your liquid loss and save energy as the soup will properly bubble like a higher heat simmer. You have already seen the finished product, but man was it amazing. Sincerely did I think that the picnic portion was perfect for two, but I underestimated how good the food would taste out in that foggy cold. Usually my dishes don’t taste so spectacular, but if the fog had to keep away a beautiful sunset I guess my food had to make up for it, so said the universe that night. As I am a food writer I love giving out my long explanation, but I also have the recipe in short version on another website. I would give it out here, but I don’t seem to have that nice recipe writer that most food blogs seem to have, so you all get links. But don’t forget I served cornbread with this dish and boy did that complete the meal. The recipe calls for 1/4 cup of maple syrup, but I used about 1/2 cup of honey for more sweetness. If you don’t like it that sweet keep the 1/4 cup amount. And I know some vegans don’t count honey as vegan, but whatever. I’m not vegan and had honey on hand… OH and also, I used a 9 inch pie pan and it cooked up in 30 minutes beautifully.